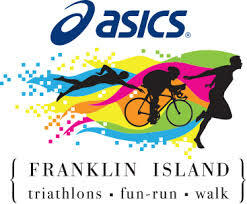 The ASICS Franklin Island Triathlons is now in its fourth year and is a World Championship Qualifier that caters for every member of a family. The day starts with a short/fun triathlon with a 160 metre swim, eight kilometre cycle and a 1.5 kilometre run/walk. The second event is a five kilometre fun run/walk or push a pram. The third event is the main event for the day, a Sprint Distance Triathlon with a 750 metre swim, 20 kilometre cycle and five kilometre run. Any member of the public can enter these events if fit enough to complete in a reasonable time. The fourth event is a mini triathlon for children aged five-16 years, 50 metre swim, two kilometre cycle, 400 metre run/walk. The fifth event is presentation of category winners along with random draw prizes for anybody who has completed their event.